Tweeting inappropriate memes. Instagramming lunches. Facebooking a few office selfies. These are the events companies fear will flood their workplaces if they let employees use social media on the job. Unfortunately, for businesses that ban the use of social media in the workplace, it is likely your employees are using it regardless of your policy. According to the Pew Research Center, 77 percent of workers reported they use social media while on the job. This data shows that while you may think your company is doing a good job curbing social media use in the workplace, it is likely not. Employers should limit the time and energy they spend on stopping employees from using social media in the workplace. Instead, they need to focus on how they can channel social media use to benefit their employees. Here are seven reasons social media in the workplace can help employees. This reason was the number one purpose employees used social media while at work, according to the PRC survey. Taking an occasional mental break from work is not something that should be discouraged. Many employers already encourage employees to take brief, periodic, breaks while working. 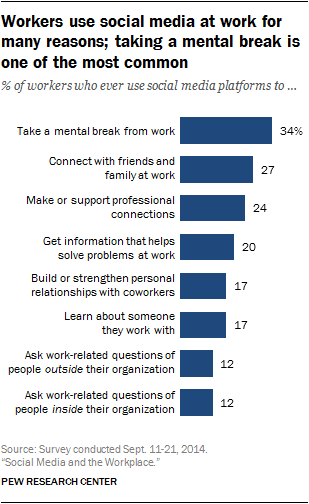 Allowing employees to use social media simplifies these breaks. Workers can now take a break when and wherever they choose rather than going to the break room to the read the paper or interrupting another employee’s work to talk to them. Now, your staff shouldn’t spend their day stumbling through the office on their various devices. But, social media, when used responsibly, can give your workers the short mental breaks they need throughout the day. Through social media sites, your employees can strengthen professional relationships with people outside the company. Then, these relationships can lead to opportunities that would otherwise not have been available. More and better connections may result in sales leads, interest in employment, business opportunities, and new ideas. LinkedIn is specifically geared towards these types of connections and has a plethora of obvious business uses. Social media can help employees when dealing with a difficult work problem. If an employee has an issue they can’t seem to solve, social media may be the answer. Posing a question on social media is a simple and quick way to get several possible solutions. Even if none of the answers are used to solve the problem, the information they provide may spark to a new solution. Sometimes an outside perspective is needed, and social media is a means to gain multiple new perspectives, quickly, easily, and for free. Coworkers can use social media to interact with one another and build better relationships. A stronger relationship among employees leads to more cohesive and productive work teams. Social media is an easy way to encourage communication between employees and help to share ideas and increase engagement both while at work and at home. Because social media is accessible almost anywhere, your staff is able to interact with one another even when not at work. The ability to interact outside of work will help boost employee morale and engagement. Your work teams, especially, could improve as they grow closer together. Similar to number three on this list, employees can use social media as a form of communication to discover and deliver job-related information. Social media in the workplace is another avenue for workers to find information that is relevant to the job or discover new information they can apply while on their job. It is also a way for your employees to spread information about your company. This transmission of information can help with brand awareness and open up new recruiting and business opportunities. Social media is a tremendous avenue for recognizing employee accomplishments, both internally and externally. Through social media, your company can give recognition to outstanding performance, work anniversaries, new hires, etc. This recognition allows team members to interact, which works to build team cohesiveness. Employees can congratulate each other, keep up with the company’s current events, and interact with more of their colleagues. The interaction and ability for recognition that social media provides can improve overall employee morale. Employees who are more engaged with their firm and their coworkers are more likely to stay in that business. Social media can reduce your company’s turnover. Evolv, a big data firm, found a connection between social media use and increased retention. Their study of 39,000 hourly workers found that employees who used 1 to 4 social networking sites on a weekly basis stayed at their jobs longer than their peers. Contrary to popular belief social media usage may not negatively impact your company’s productivity. In fact, social media could actually unlock some productivity your employees have yet to tap. A study by McKinsey Global Institute discovered that while 72 percent of companies are using social media, most are not using to its fullest potential. According to this research, if companies were to fully implement social media use (including an internal social media site) they could improve employee productivity by 20 to 25 percent. Every business wants their employees to be more productive. Social media is an easy-to-implement and inexpensive method that can positively affect your company’s productivity. Social media has spread rapidly and undergone massive changes. It now stands as a near-ubiquitous commodity; social media in the workplace is almost unavoidable. Rather than police your employees use of social media, encourage them to use it productively Demonstrate and reinforce the ways that social media can improve employees and the workplace overall. Treat the use of social media in the workplace as a performance issue. Employees should be focused on their performance, rather than whether or not they can sneak in a selfie.